Do you want to go adventurous? Do you want to spy on your cheating partner or want to have a vantage view of your entrance for security’s sake? Or maybe you want to spy on a private meeting but it is too bulky, unnecessary and costly to install a CCTV camera in the meeting hall? Do not worry; I’ve got the answers to your worry as I am going to show you how you can turn your Android phone to a very powerful tool to record a live video and save it remotely to your Laptop. Without much ado, let us delve into the subject of discussion. Before you launch the app, let us continue with pairing the devices. I will show you two methods. Two devices which are connected to the same network (Say a Wi-FI) are also technically connected together. So if we can lay our hands on a Wi-Fi router or a get a second phone such that we can connect the two devices (PC and Android phone) to its hotspot, we will established a connection between these two devices. The hotspot acts like a link between the two devices. 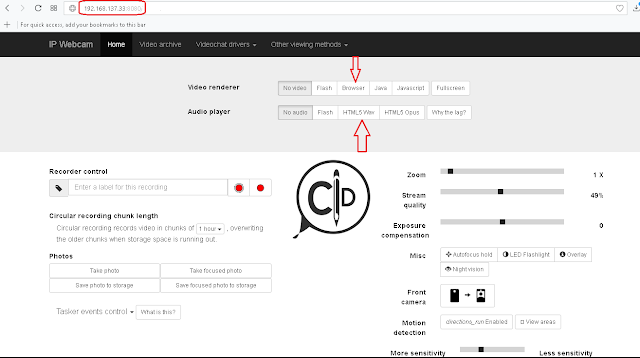 The advantage of this method is that we can connect more PCs to the Wi-Fi network to watch and record the video your Android phone is broadcasting. The disadvantage is that you will have to spend extra money procuring the router. If getting a second phone or a Wi-Fi router to create a hotspot connection will be too costly for you, you can check out the second method below. Instead of involving a Wi-Fi router, we can actually link the two devices directly. 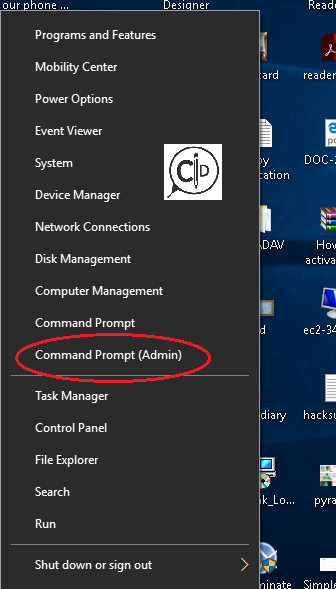 It is conventional to connect the PC to the phone’s hotspot, but for some reasons which I would not want to bother you with, the reverse will have to be the case; we will create a hotspot with our PC and connect our phone to it. netsh wlan set hostednetwork mode=allow ssid=ChrisNetwork key=chrisnetwork123 . Remember, your password must be at least 8 characters. netsh wlan start hostednetwork followed by the ENTER button. This command will turn on your hotspot. Now that your hotspot is ON, you can now connect your Android via Wi-Fi using the password you created in step C above. 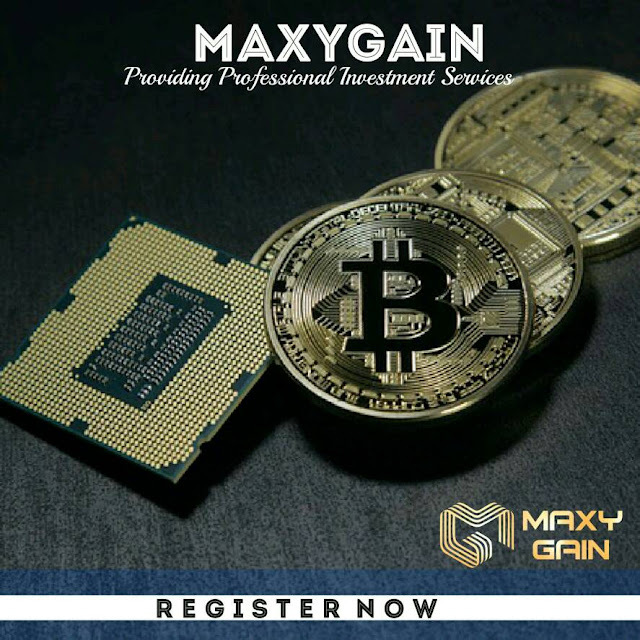 The advantage of this method is that you can connect more than one Android device to the PC and use their cameras to get different angles of the environment. 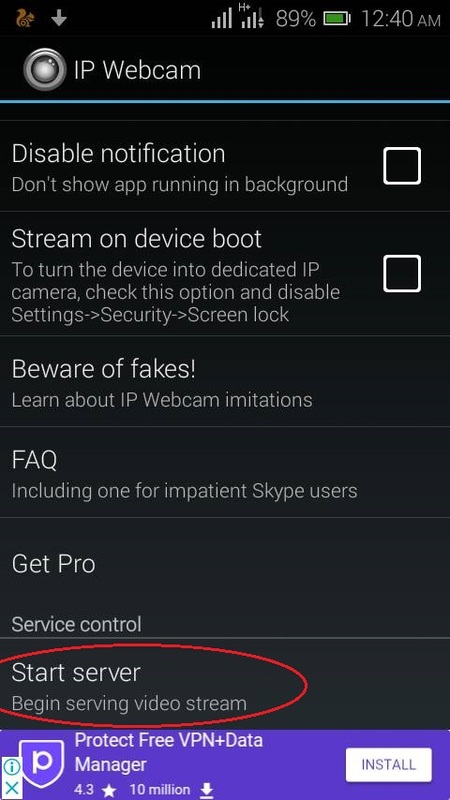 If you used any of the methods above to pair your devices, it is time to launch your IP WebCam app. Once the app has been launched, you will see a list of customization options. Scroll to the bottom and click on Start Server. This will start your phone’s camera. 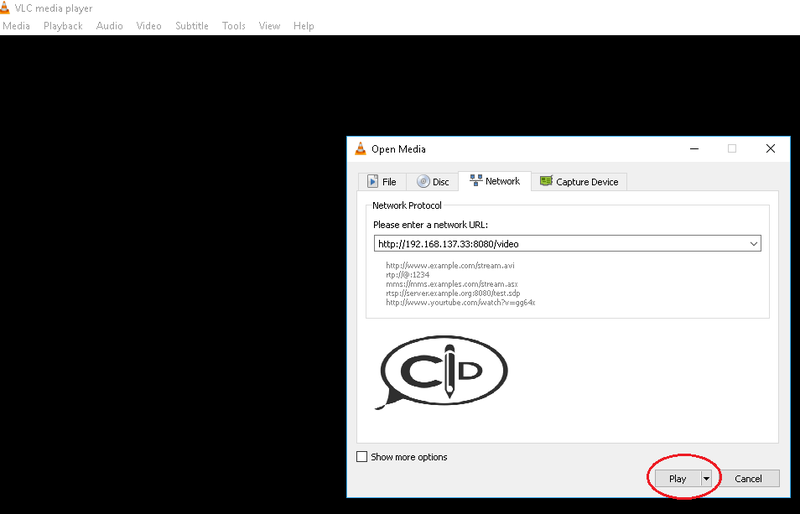 While on the camera, you will see an IP address on your screen. It will look similar to this: http://192.211.234.033:8080 . Launch any browser on your PC and enter the camera’s IP address. If you did everything right, a webpage like the one below will open. Perfect! Now wave your phone’s camera and you will see it mirrored on your PC! I will leave the strategic positioning of the camera for you to handle. Also explore the various options on the webpage like camera zoom, LED flashlight, motion detection, full screen, etc. You can move your laptop away from the camera to know how far the connection can go. Ok. We’ve got a little problem on our hands. The videos are saved to our phone instead of being saved to our PC. What if in a worst case scenario the phone gets discovered or stolen? I bet we might lose the video footages! To fix this collateral damage, we need to have a copy of the video saved to our PC. We will have to employ the services of VLC media player. 1. Open your VLC player. 4. 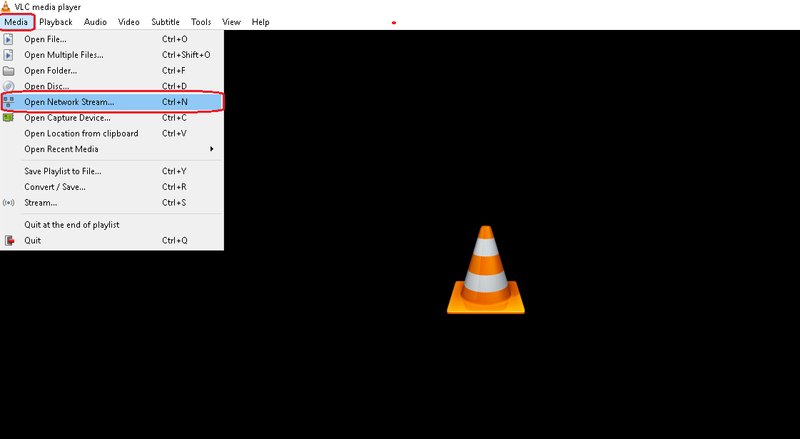 Once you start playing the camera’s video with VLC, right anywhere on the video and click on record. 5. 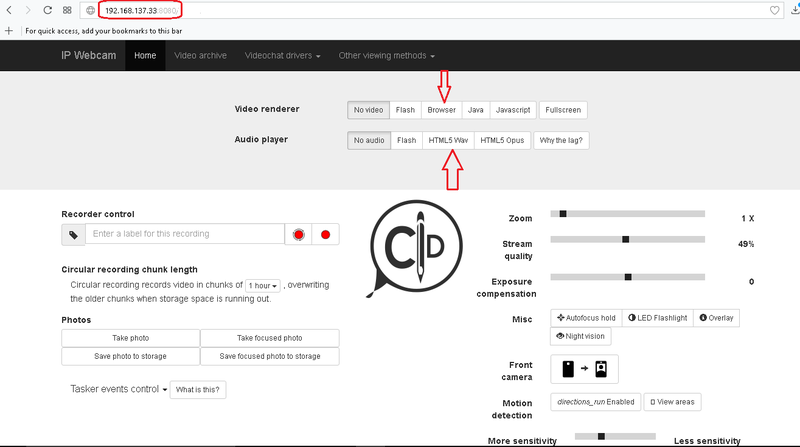 To view the video you have been recording, right click again and click on Stop. 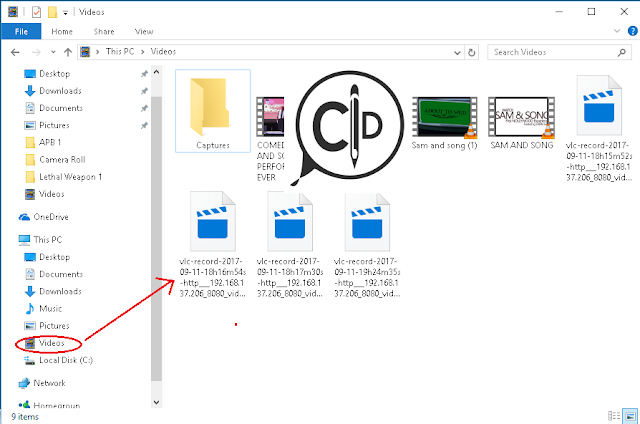 Open your file explorer and click on Videos. There, you will see the video you just recorded. Video transmission over the Wi-Fi does not require Internet connection. In other words, it is free and does not consume your data. While the video is saved to our phone by default, we can use VLC media player to record the video on our PC. We can connect more than one phone to get more camera views. We can also view the video broad cast from more than one PC. We can buy a long USB chord to connect the phone to a nearby power socket. Properly concealing your phone makes this exercise more adventurous! Technology is moving with a fast pace and we can only try to catch up. We have seen how we can turn our old phones to very powerful assets. Do well to experiment with it and also remember to apply discretion.